Rm. 202 Kids Take Over–Read Aloud! Last week I was having a reading conference with a friend, and as we were talking about TBR piles and good book recipes, another idea came to me that would help one reader, and then in turn many others: kiddos doing read aloud. As I continued to talk to this friend about books, I suggested that he choose a book from his new TBR pile to share with the class. We talked about how he would have to prepare to do this, including practicing holding the book up so that everyone could see the pictures. It was totally picture-worthy while he was working. He continued to work and was ready to present to us. Man was he excited! Well…as you can imagine, this sparked interest by many other people to be able to share with us at read aloud time. And what a great idea, as I considered all of the many things kiddos learn on both sides of this opportunity. We began to schedule read alouds in a couple of ways: I gave some friends the assignment based on books we were reading in our small group together, and some friends just began to request a spot. And since then it’s become a “have-to” for everyone. It’s just such a good idea that we (ok, probably I) decided all should participate! Amber took the next turn, and did a super job of matching up to what my lesson would have been that day anyway–good readers use evidence from the text to support their thinking. Then on Friday, Emily took her turn and taught us about fiction/non-fiction (as well as using some pretty great teacher moves for management!) with The Little Work Plane. Now don’t worry if you don’t see your favorite Rm. 202 friend in this post–each will get their turn. While I had originally never intended to take this path with readers in our room, it’s a SUPER example of how organically ideas come up for us, and how kids’ ideas are often the BEST ideas! Thanks, Rm. 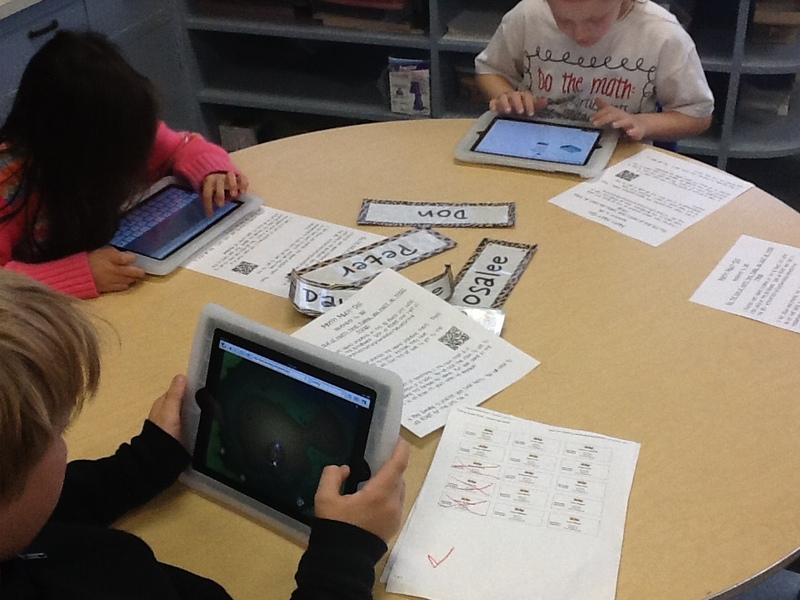 202 kiddos for taking chances, learning new things and then sharing that learning with the rest of us! Well, he’s a movie-maker. A real one. Ok, I don’t think he’s a Hollywood movie maker, but he does work at a local university as a filmmaker, and he was making a movie with footage of our class! Our school is working on a movie to highlight the fabulous things we do each day with teaching and learning, and I was asked to talk about how technology has changed the way I teach and the way kids learn in my classroom. I did a short piece earlier in the day, and then he came to take some shots of us as we utilized the iPads during our math rotations. My kiddos were pretty excited about being famous! 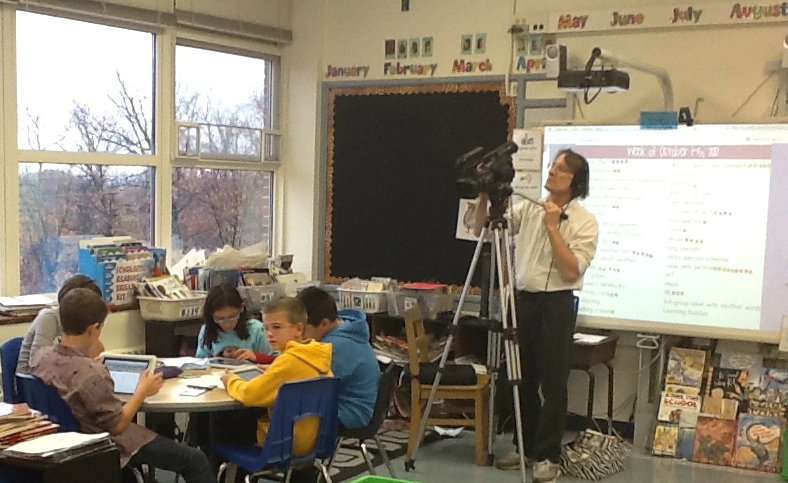 Can’t wait to see the finished video that showcases the amazing things that happen at our school every day. It’s a fabulous place to work and learn! 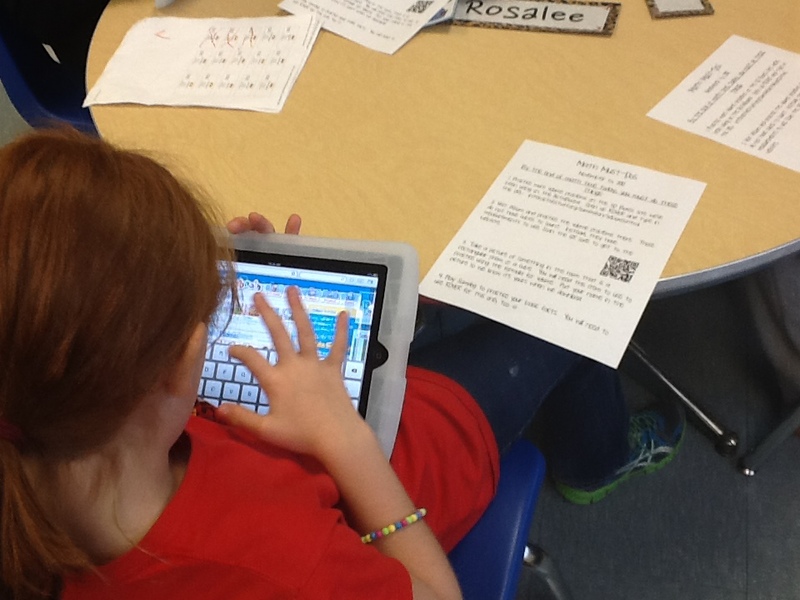 I took this opportunity to introduce my friends to QR codes, which they were really excited about using!